It seems that Microsoft and Google have been duking it out for office application dominance since Google launched its web-based word processing application, Google Docs in 2006. Over the past nine years, Microsoft released its own web-based productivity suite with Microsoft Office Online as well as a completely subscription-based, cloud-hosted version of Microsoft Office known as Microsoft Office 365. Google in turn has released updates to its online productivity suite and has taken a large percentage of the enterprise market as more businesses switch to Google Apps for Work. This week, Google took another step in its race to office applications dominance by announcing a Google Drive Plug-In for Microsoft Office users. With this new plug-in, users can save and store documents and other files created in Microsoft Office right to Google Drive for access across devices and platforms. Taking aim at Microsoft’s foray into cloud-based applications, Google is now allowing users to create and edit documents in a program they are familiar with, while still providing the scalability and security Google Drive offers. This new plug-in is in direct competition with Microsoft’s online cloud-storage system, OneDrive which allows users to create, edit, save, and collaborate on Microsoft Office files across devices. As of the time of the announcement from Google, the Google Drive Plug-In for Microsoft Word is only available for Microsoft Office 2013. There is no word as to whether Google will release versions that are compatible with older versions of Microsoft Office, and if the plug-in will be available in Microsoft Office 2016 which is scheduled to launch later this year (although we can hope they do). With the plug-in, users can create and edit Word Documents, Excel Spreadsheets, and PowerPoint Presentations in Microsoft Office and then with one-click, save them to Google Drive. 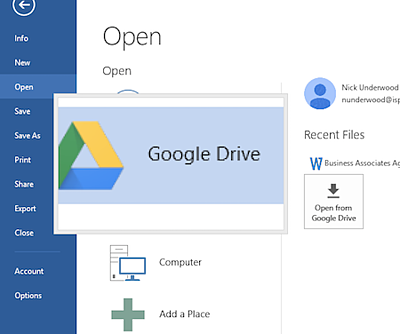 Furthermore, users can open files from Google Drive right into Microsoft Office through an extension that Google released back in November 2014. Users can simply “right-click” in the file and then select “Open With” with the associated Microsoft Office program. Once they are done editing, users can save it back to Google Drive if they have the Google Drive Plug-In installed, eliminating the step of having to save locally and then upload to the cloud. The good news for users running older versions of Microsoft Office, there is a similar Chrome Application that allows users to open, edit, and save files from Google Drive in Microsoft Office without having to save locally. AwesomeDrive for Google is a Chrome Application that allows users to open, edit, and save files accessed from Google Drive in Microsoft Office without having to download and then re-upload to sync to Drive. AwesomeDrive works with Microsoft Office 2010, 2013 or 2016 Preview on Windows and on Mac OSX with Microsoft Office 2011 or 2016 Preview. The only catch is that users need to have an active internet connection to collaborate, edit, save, and sync files to Google Drive whereas Google Apps for Work and Microsoft Office 365 offer local storage options in case internet connectivity cannot be achieved.